1.6.2 D*Talipapa is a wet market. We had finally reached the boat station to take us from the Mainland to the Island. There was an overnight stay in Manila (not the best conditions), an airplane ride, and a bus ride that preceded arriving at the dock. Two slight, but very strong, young men helped load our very heavy luggage onto the roof of the small boat we were to board. “Salamat”, as I extended my hand to one of the men and handed him a tip that he very much appreciated. His use of English made me realize that my accent or lack thereof, or maybe the luggage, gave me away. I was a foreigner in my ancestral home. My Tagalog needed some practice. 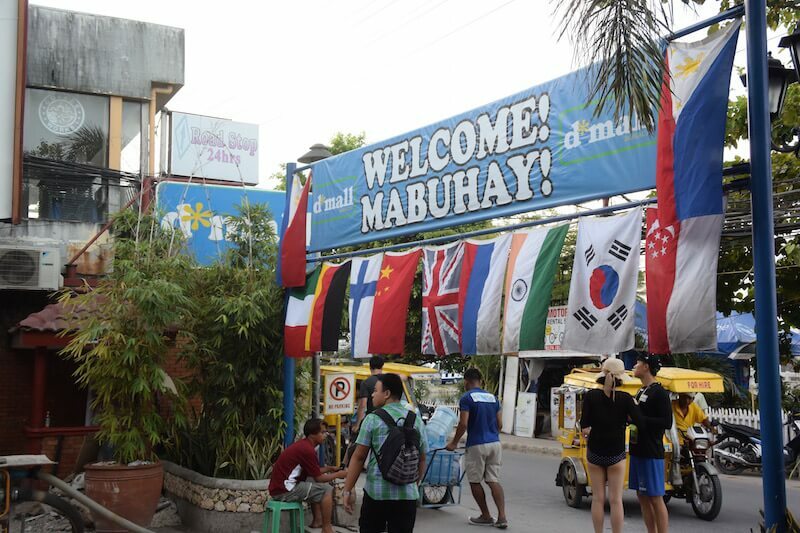 We were in Caticlan, one of the gateways that would bring us to Boracay. As the boat pulled up anchor and started to drift away from the port, not a word was spoken between my daughter, wife and I. The water, aqua in color and as clear as day, was nothing like we had seen before. This was the Philippines we were all hoping to experience. The ride across the strait was short, and as we arrived on the other side, children, playing in the water, swam toward the direction of our boat and hung onto the hulls. Their eyes full of wonder and smiles bright as gold. It was quite the welcome. There would be one more ride on a van that took us to the place we would call home for the next month. Our bags were unloaded in front of the property that was covered with trees, plant life, and flowers that made us instantly feel we were far, very far, away from where we came.The small street in front of the property was at a bottleneck caused by automated rickshaws, they call trikes and minivans loading and unloading tourists. 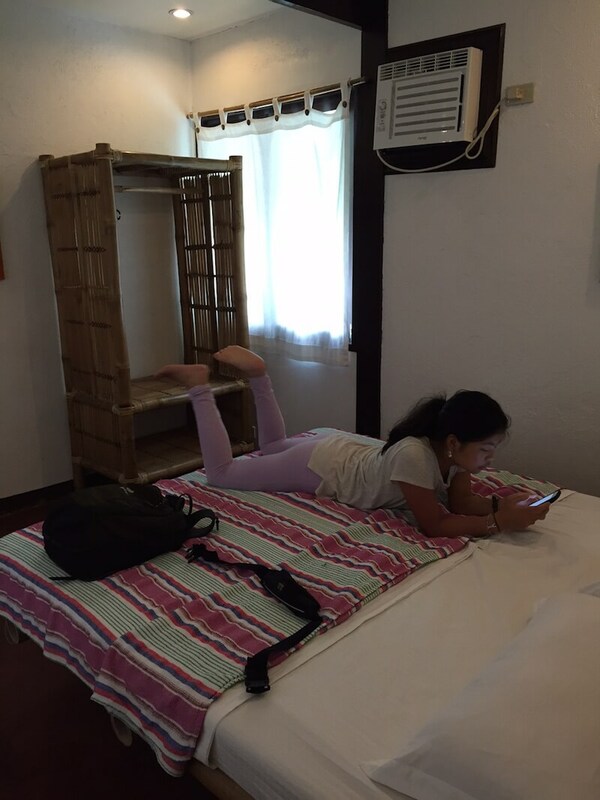 Once we entered the property, away from all the commotion, we felt relaxed in the oasis that is the Blue Bayou Bungalows Boracay. A young man, with a yellow polo shirt, upon seeing us enter the property, quickly ran up front and relieved us of our luggage. A young lady named Christie, with her warm smile, checked us in and handed me the key to our bungalow. The young man in the yellow polo shirt, named Mark brought our heavy bags to the front of our room, which was located up a flight of steep wooden stairs. Brenda keyed the door and slid them open, and inside was the kind of home that we had hoped to have for a long stay. Being elevated made our terrace secluded, which would later become, what I call my office. It looks over the rest of the beautiful property that was filled with even more foliage and other bungalows. The thatched roof in the living room made for a perfect getaway effect. Hung from a beam was a ceiling fan, which upon entering, helped cool our overheated bodies. The bedroom behind it, air-conditioned, was an added bonus. Beyond that was the bathroom, modern, perfect for city folk like ourselves. If there was one room that would be called the piece de resistance, it would be the kitchen. Near the sink is a window that looks out onto a garden and with the curtains drawn open, the whole place immediately gets drenched by the sun. We were definitely a far cry from Grand Street and Mott (in New York City ). We had finally arrived in Boracay. On the grounds are two cats, Tom Jones (female), and Casper. They belong to the property and quickly became acquainted with us, both lounging on our porch immediately. It was a semblance of home that Bailey needed, missing Wilhelmina, our cat that we had left behind with our good friend. Bailey, as I unpacked, quickly put on her one piece bathing suit, blue with anchor designs on it. Brenda wasn’t far behind, putting on her favorite two-piece paisley bathing suit. I dropped everything and put my, not so loose, swim trunks on. I hadn’t put that item of clothing on since last summer, and I realized that my 47-year-old frame was slightly larger than my 46-year-old frame. To make matters worse, I opened the fridge and drank a very cold San Miguel Beer, which added to the heft. The fact that it was the equivalent to $1 U.S. Dollar made me feel better about my decision to put a little more around the waistline. As a father, it’s important to keep my promises to my daughter. We were off to the beach. No ordinary beach, but the famous White Beach of Boracay. The place seemed almost like a folklore before now. Filled with excitement, we quickly exited the property without having asked the direction to the beach. Instead of backtracking, I approached a local, and with my somewhat idiomatic Tagalog, asked for directions to the White Beach. The gentleman, with a tank top, that read, Boston Celtics (Number 33, of course, for Larry Bird), pointed toward a general direction. I nodded and we did our best to follow where his finger pointed. We eventually reached a main road, where we saw a sign for the D-Mall, which I had read about in some articles and knew from that marker that we were near our destination. [Tweet “The D-Mall is a strip of shops and restaurants that eventually lead to the beach.”] The D-Mall is a strip of shops and restaurants that eventually lead to the beach. It was filled with tourists from all over. There was a smattering of Americans, but mostly Germans, Norwegians, Koreans and Chinese. We were pleased having found this lively area, but I was hell bent on finding something local. 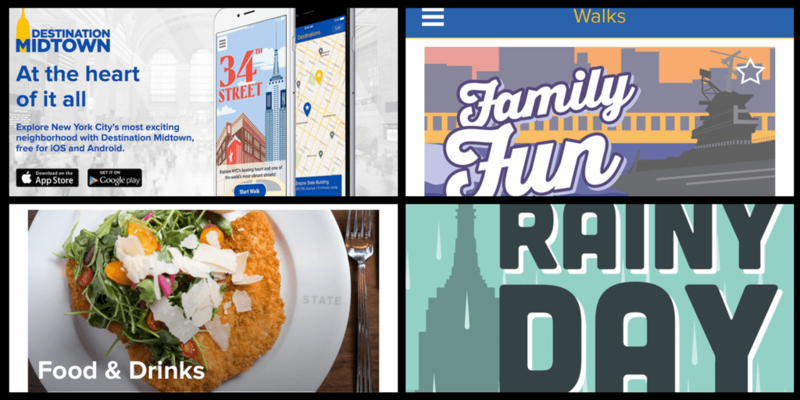 We were hungry, so what better way to do something local than to eat local fare. Not wanting to stray too far, and with a child waiting with bated breath to see the sea, I quickly decided for the family and settled into an eatery specializing in something the Filipinos call, Chicken Inasal. It is especially famous in this region, which is called the Visayas. It’s a grilled chicken dish, in which the bird is marinated for a long period of time in garlic, crushed peppercorn, salt, vinegar, lemongrass and the juice of the famous calamansi (a small lime-like citrus fruit). The bird is then dried out a bit and then basted with annatto oil, garlic and vegetable oil during the grilling process. It’s not of the moist grilled chicken variety. The finished product is akin to jerky in texture. With some white rice and a bit of spicy vinegar, it made for more than an agreeable start. By the time we got to the beach, it was late in the afternoon, but the sun was still shining over the clear water. There was a bit of the wind on the White Beach side of the island that day, which made for some waves to play in. We laid down our towel and jumped right in. There wasn’t that expected shock we had gotten used to all our lives, the water was warm and soothing. This was no folklore, this paradise truly existed. Then came that moment, when Bailey dives in and when her face finally reached the surface of the water, she gives her mother and me a big smile. [Tweet ““that eternity is when time stands still, not when time never expires”. – Gaudi”] It reminded me of a quote I heard while watching a documentary about Gaudi in which he said, “that eternity is when time stands still, not when time never expires”. My prayer is that my eternity, be a still of that moment. Having gotten in a proper swim, we ended our evening with a walk on the beach. The whole strip was filled with families, lovers, and night revelers alike. On the outskirts, the seaside businesses were readying themselves for the night to come. Lanterns were hung on trees, lounge chairs were replaced by tables and chairs, and the music started to get louder. On the beach, kids were starting to take down their makeshift soccer fields and people gathered around lit sand sculptures made by locals looking to make a little money off a “selfie” crazed crowd. The sun started to set on the Sulu Sea, and one can’t help but appreciate God’s attention to detail. It’s unthinkable to ever tire of that scene. I was, however, feeling a little peckish, so I do somewhat get tired of it and coax the girls to get something to eat. They obliged very quickly. The three of us are definitely cut from the same cloth. Our stomachs took precedence above all things, even God’s lovely display of the sun setting. On the way back to the bungalows, before getting cleaned up for dinner, we stop at a place called the Budget Mart, their local supermarket. We loaded up on our treats for the week. I went straight for the peanut department. Filipinos love their peanuts and there were plenty of flavor combinations to choose from. There are the expected salted and unsalted varieties. There was also more flavorful ones such as sour vinegar and spicy red chili. Then further down the rack, it got interesting, with offerings ranging from pork adobo, to fried shrimp, to chicken barbecue. I get them all. At the equivalent of twenty U.S. cents a bag, why the hell not. Brenda and Bailey loaded the cart with an assortment of chips. Brenda favors a brand called “Chippy”, corn chips that remind her of her childhood in the Philippines, and like me gets every flavor available. Bailey, a fan of chicharrones since early childhood, follows suit and grabs a bunch of different types. Upon getting to our bungalow, we felt so at home that we decided against a proper dinner and spent the rest of our evening flipping through the channels on the television and enjoyed our newly bought treats. It was a perfect end to our first day. Sometimes, the further one travels, the closer they actually get to home. I’m glad we made the long trip. Did you like this first “dish” about Boracay? Have you tried Chicken Inasal before? We’d really appreciate you sharing this story with your friends. There’s so much more about Boracay to come, so stay tuned. Salamat Po! The only way to get into Boracay is to stop in Manila first. We took Philippine Airlines from Hong Kong to Manila and stayed overnight at Nichols Hotel, which was cheap and close by. It’s the best way to do it because Manila is notorious for its traffic jams. Philippine Airlines is cheap but you have to pay for luggage. We ended up paying $150 more for our overweight luggages and if you are a violinist like Bailey, they require for you to check in the violin, just be sure to tell them how fragile and expensive it is so they will take care of it and require more paperwork for protection. We flew into Caticlan from Manila. At the airport (a teeny tiny airport) there are expediters who will ask you to register and pay 600 pesos (about $13 each) each to enter the island and to “shuttle” us around first in a van, then a ferry and then another van. The whole trip took about 20 minutes with porters helping you with the luggage, whom Andrew tipped. The whole process was a bit chaotic with many people involved, but it works. 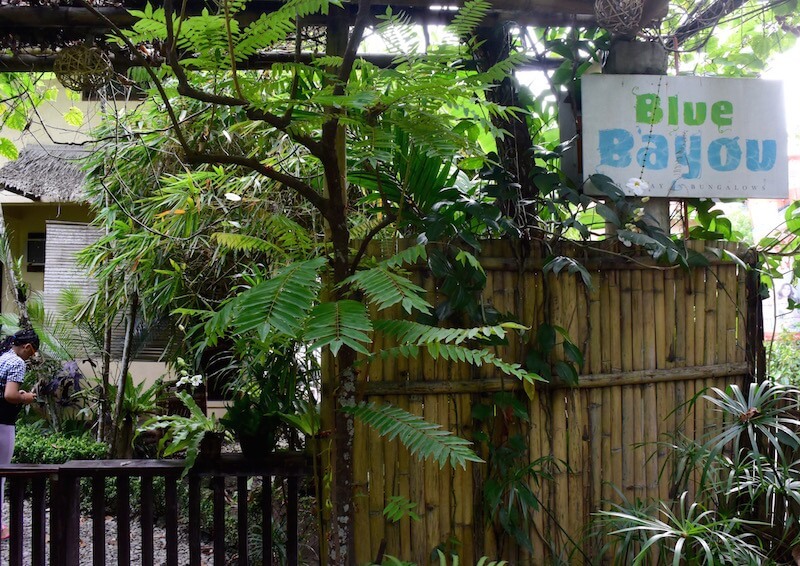 Blue Bayou Bungalows in Boracay was our home for a month. we stayed in an air-conditioned bungalow with a kitchen. We were all very comfortable. Dian and Hans, the owners, are just fantastic. They are very hands-on with their property and completely welcoming. The island is tiny, we mostly walked everywhere. When it was too hot though, we used the trike to the further beaches like Diniwid, Puka and Ilig Iligan (check below for more details). Most trike rides around the island was about 75 to 100 pesos for the 3 of us. Where we had our first meal. Loved their chicken and the atsara. It’s very convenient, right at D’Mall. D*Talipapa is a wet market. The fishermen haul their catch under this tin-roofed area behind Station 2 and sell off the fruits of their labor. The scene is like taking part of dozens of micro auctions going on at the same time. The buying frenzy was infectious and resulted into us buying too much seafood for three people. The idea is to bring your purchase to one of the many restaurants that surround the market, and for a nominal price, they will cook and prepare what you bought. In our case, we had our fish and squid fried, our crabs steamed, and the shrimp grilled. It is highly recommended to this with a big crowd. The more the better. On Bulabog Road, there’s that intersection I spoke of earlier where the church was located. Walk past the Church and right before you reach the main road, you’ll find to your right-hand side, The Secret Garden. Hans introduced us to this eatery and it was by far the best Turo-Turo type restaurant on the Island. Turo – Turo, literally translates into “Point – Point”. Just go toward the counter, where there is food laid out on display, point at what you want to eat and they will dole it out to you with a portion of rice. It’s a fun way to get your feet wet if you’ve never had Filipino Food before. It’s akin to having tapas, where you can get a few small portions to try. Order their Lechon Kawali (Fried Pork Belly) and you’ll find out why Pork is King in the Philippines. This was our favorite restaurant to have a good salad and very good pasta. They were right next to the Red Pirates. It was always a great way to end the day there with a good meal. Go there for your snacks! It’s right at the entrance to D’Mall. If The White Beach is the refined one in the family, then Puka Beach, Ilig Iligan, and Diniwid are the wilder sisters. As in most cases, when you get to know them, they are in some way sexier and more attractive than their perfect sister. These gals have personality. On Puka Beach, Brenda, Bailey and I walked far enough down the beach where we couldn’t see the entrance to the beach anymore. We were waved over by a couple of men, that offered their makeshift lounge area to us, along with their services. I spoke to the two men and got to know more about the land they lived on. Puka Beach is where you’ll see the last vestiges of the once very tropical Boracay. Behind the beach, the landscape becomes extremely wild and green. Apparently there are still monkeys swinging on vines up there. Furthermore, I was told that the San Miguel Corporation stopped a company from developing in the area. In their honor, I drink a San Miguel Beer with the guys. After a few beers, and a few laughs, the guys offered to catch a fish and prepare lunch for my family. I took the offer and we all had the best, grilled fish we have ever had in all our lives. Grilled fish at Puka Puka Beach. The pretty sister was throwing a bit of a tantrum one day, so we headed over to the quiet, not so pretty sister, Ilig Iligan. She’s the sister you really have to get to know from the inside. She’s a bit cloistered, and it takes a bit to warm up to her and she to you, but when you do, it makes for a wonderful experience. It’s with this gal that you’ll find the best snorkeling on the island. The sexiest and most fun sister is Diniwid Beach. Diniwid Beach is where the famous Spider House Resort and Restaurant exists. From the porch of the bar, is arguably the best vantage point in all of the island to experience a perfect sunset. What a beauty. So glad to hear you liked the place you were staying at for a month! That’s so important, especially on longer stays. 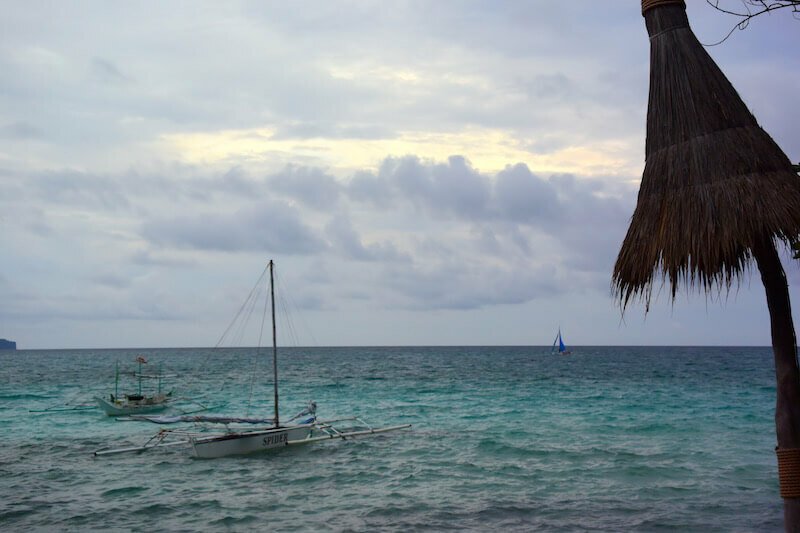 Boracay sounds like a really great place, and I’m glad I could “visit” it through your post! Thanks Jolanta. Heard you were in New York. Hope you and your family enjoyed our hometown. 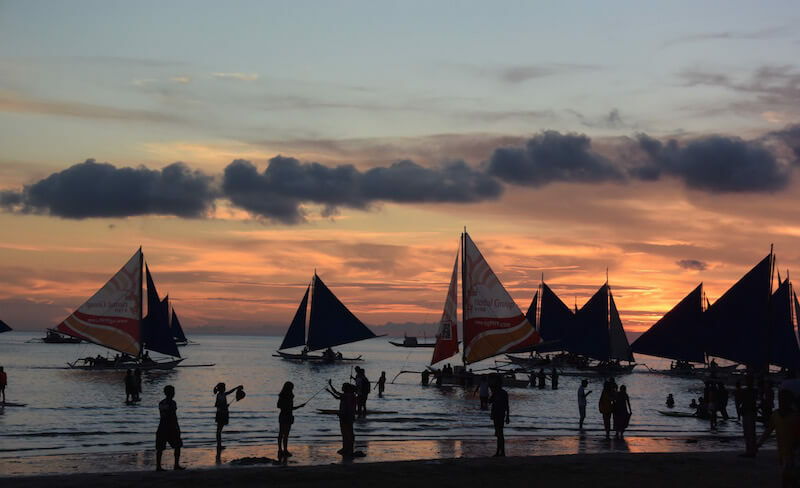 Great pictures of Boracay, Andrew! I’m regretting never visiting there but maybe someday, my wife and I will get a chance. That sunset picture is just awesome, honestly. I love it and wanna be there right now. Those sunsets remind me of our time on Palawan and El Nido, and the beautiful colors that would come at sunset. I really is more fun in the Philippines and this wonderful post has shown me just that. That chicken looks awesome btw. Thanks for making me hungry! Aah, what a wonderful start to your journey. Is Boracay where you were born Andrew?